I went up to the wonderful little town of Driggs, Idaho for the solar eclipse. Found some rolling hills off the back roads with perfect unobstructed view of the Tetons, and set up for the duration. I can understand how earlier cultures might have thought the world was ending. About halfway to total occlusion, it became noticeably darker, and also noticeably cooler. It was a strange sensation, no clouds in the sky, but really felt like the light had just vanished. Then, during totality, the shadow swept across the hills, and every direction had an orange sunset glow. 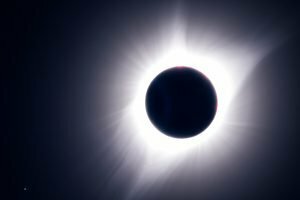 The sun looked like an angry black hole, the corona danced around the moon. The birds stopped flying, the ants stopped moving, everything was eerily still. It was one of the most wonderful experiences of my life.